​THIS IS NOT YOUR TYPICAL PADDLE RACE FORMAT!!! The 1st Annual Wakki Wachee Time Trials will be held Sat. Aug 6. This is a 5.5 Mile “Prediction Time” race. There are no age, board or gender divisions. You simply guesstimate how much time it will take you to paddle 5.5 miles down current on the beautiful 70 degree, crystal-clear fresh water of the Weeki Wachee River, one the most scenic waterways in Florida. Go fast or slow but whoever finishes paddling closest to their predicted time is the winner. During registration you will be asked to determine your predicted time. This field cannot be left blank. You will only have 1 chance to change your predicted time, at the Pre-Race Social, package pick up, Friday August 5th at Crackers Bar and Grill. Online registration closes Friday, August 5th at 4pm. Pre-Race Social registration will be open from 5 - 8pm. Because of venue time constraints there will be no race day registration, ONLY Race check in. The racer who is closest to their “predicted” time (+/-) is the winner. In the event of a tie breaker the fastest time wins. Best Costume - This river is famous for mermaid and manatee sightings! 6:30 – 7am Race check in at Paddling Adventures. YOU MUST CHECK IN, even if you were at the Pre-Race Social, this is to confirm the actual number of racers who enter the water. You will receive a MAP in your race bag, please use it. 7:10 – Pre Race Safety Briefing by Paddling Adventures Safety Coordinator – MANDATORY - ALL RACERS must have a PFD, preferably a waist PFD but one strapped to the board is acceptable. Leashes are not mandatory and could be a safety hazard, ONLY coil leashes that don’t drag will be allowed. 7:20 – Race Director Briefing – you will receive direction for launch and timing procedures. 7:30 – Time Trials will begin at the launch, make sure you have your number visible to receive the most accurate time. Racers will be released 3 to 4 at time from the ramp. Once on the water, you will be given the go. Do not crowd the ramp or launch before called. Your safety is our biggest concern. 8am – All racers must be on their way. If you are late or unable to launch, for any reason, you will not be able to participate. No exceptions. 9:30 – Shuttle services from Rogers Park will begin return paddlers and boards back to Weeki Wachi Springs State Park, Once you return to WWSSP, please retrieve your board and personal belonging and exit the Paddling Adventures Park. This time of year is peak season and parking can be very crowded. Please be considerate of the Paddling Adventures operations as they launch 600 people a day into this spring. We anticipate all participants to be off the water by 10:30. If you have not reached Rogers Park by 10:30, you will be eliminated from the trials and water safety will perform a relay search until you have been located and the sweep boat will assist you. You must present your race bib to receive the racers discount for any food and beverage purchases made at the awards. 7pm - Sunset paddle in Kings Bay, Crystal River, FL. Launch site to be determined, but it will probably be within wallking distance to Crackers Bar and Grill. 9:30am - 12 pm Morning paddle exploring the various canals and waterways around King's Bay and Crystal River followed by lunch at a local waterside restaurant. Launch site to be determined, but it will probably be within wallking distance to Crackers Bar and Grill. Times and locations are subject to change at the Race Director’s discretion. 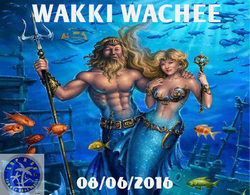 Wakki Wachee Facebook will post all changes and updates. Upon arrival at Paddling Adventures please unload your gear in the “Unloading Zone” and move your vehicle immediately to a designated parking space. Paddling Adventures has designed a staging area where the boards will be unloaded at the return. Please remember you are responsible for your paddle, PFD, leash and other personal property. You can retrieve your board once all boards have been unloaded. The launch and return fee is included in your entry fee. This is a service being provided by Paddling Adventures. It is your choice to use the return service. You will be assisted by Paddling Adventures crew members out of the water when you reach Rogers Park. Please proceed to the Kayak ramp just past the finish line (the end of the floating dock) where your time will officially end. No refunds can be given if you choose not to utilize this service. If you choose the return service provided, your board will be loaded onto the trailer that will be stationed there by a Paddling Adventures crew member. They will use caution in placing your property securely and safely, using either cardboard or carpet to separate the boards. They will be stacked in some cases. Visible timing devices will not be permitted. In other words, yes you can use your GPS, Exercise App or other technology, however, it must be hidden and not easily accessible. This is an old fashioned endurance test to see just how well you know yourself and how you respond in conditions. There is a constant 5mph flow out of the launch area at all times. Over 1 million gallons of water flows out of the head spring daily. Much of the river is under natural canopy. The river's depth averages from one foot to four feet. There are many twists and turns in the river so keep on the lookout for turtles, manatees, various aquatic birds, and the occasional otter. There are many hidden hazards underwater, downed trees, limbs and sand bars could be around every corner. Your safety is our greatest concern. In the event you run into trouble, SNG Crew Members will be scattered along the course to assist you. There will also be a sweep boat that will follow the last racers. You are welcome to bring your own coolers stocked with your refreshments of choice. Paddling Adventures offers drinks and snacks at reasonable prices at their refreshment stands. As a reminder, this is a State Park, there will be no tolerance for THE CONSUMPTION OR DISTRIBUTION OF ALCOHOL within the state park. Save it for later! Water and Gatorade will be provided at Rogers Park for the finishers.